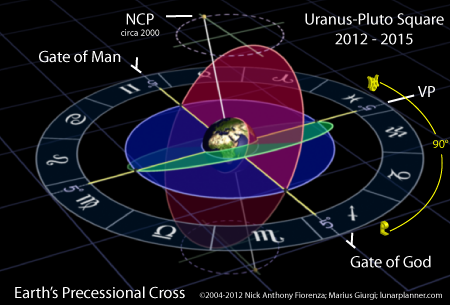 "Uranus and Pluto's placement relative to Earth's Precessional Cross at the time of the Uranus-Pluto Square of 2012-2015. Uranus and Pluto reside at the centers of their respective sidereal signs." Caption, Image Source and © Lunar Planner / Nick Anthony Fiorenza / Marius Giurgi. We need to move forward with faith and trust that through the darkness, we will finally reach the light. The Universe in all its wisdom is showing us that we need not fear the difficulties and tribulations we are about to experience. But to see it as stepping stones, to new possibilities and the potentials for success we have not thought about or had the foresight or the vision to recognize. Intense and profound debate and arguments which may be initially divisive and confronting. However this testing period will force us to see things in a new light, as we discover innovative solutions to the pressing issues in our lives and the various looming crises. Today, our new technology is the Internet, and this does give hope for a “global awakening”. We will most likely face similar challenges to those of the 1930′s, in the news we already see extremism rising, unemployment rising, nationalism rising. One big advantage we have today is the global networking that the internet provides. It will be most important that this Uranian freedom is upheld, and it will be challenged by Plutonian organizations and governments. We see the Plutonian influence already with China. We see the Uranian influence already with Wikileaks. Now to the climax of the upcoming Uranus Pluto square. The Heliocentic event of 1933 turned out to be very useful when we looked at the timing. [Th]ere is ... [an] exact Heliocentric square coming up, November 2013. As our Facebook friend Jen DeMorgan stated, “oh *$#%”. A very challenging T-square pattern. Jupiter opposite Pluto, our faith is going to be tested, as will growth and prosperity. The focus of the planetary aspect pattern is on Uranus – radical change and higher awareness. Thus, in the language of these commentators: the Uranus Pluto square in November 2013 repeats the fateful dynamics of 1933? November 2013 carries an added dimension of testing the degree to which the ideas of the late 1960s furnished a successful response to the disaster unleashed by 1933. Many astrologers are weaving celestial aspects and historical metaphors together to make a generational commentary about the Baby Boomers. The Uranus-Pluto "geocentric square" begins in June 2012 and continues through March 2015, consisting of seven triggers (the exact squares occurring due to the planetary retrogrades). During this time, on November 24, 2013, the "synodic square" occurs. The synodic square is the actual (heliocentric) square occurring in the current 138-year Uranus-Pluto synodic cycle that began on January 7, 1966, at the exact peak of the Vietnam War and the emergence of the Flower Power Political Movement. This is the first (90°) square in this cycle. The extreme cultural and societal events of the mid-1960s were a product of the Uranus-Pluto conjunction and the start of this 138-year Uranus-Pluto synodic cycle. The square occurring in 2012-2015 will stimulate dynamic cultural and societal action based upon what was set in motion in the 1960s. This few-year period should also be quite catalytic for those born in the mid-1960s. Fiorenza symbolically reads heavenly geometry to claim that this event is the ultimate measure of the Baby Boomers' generational accomplishments and remains positive in his assessment of that legacy. Another astrologer believes that these squares mark the "birth pangs for the Aquarian Age." We all know the song ‘This is the dawning of the Age of Aquarius’, from the musical Hair, first performed in 1968. The astrology in it leaves a lot to be desired (!) but there is some truth in the title. In the sixties, Uranus, the ruler of Aquarius, formed a conjunction with Pluto, ruler of Scorpio. When two planets meet together in this way, they signal the beginning of a new cycle of development. Because Uranus and Pluto are both outer planets, meaning they are very distant from the earth, they move very slowly and their effects occur across significant periods of time. Of course, the sixties saw enormous social change and the birth of whole systems of thought and behaviour which transformed many societies around the globe But this was, indeed, just the beginning. On 24th June 2012, Uranus and Pluto form their first exact square to each other. In basic terms, this signals the first manifestation of their joint effort to bring about the new age. When two planets form a square aspect, they irritate each other, but it’s an irritation that enables them to eventually create something they could not otherwise create alone. This is the time when we must all get to grips with the consequences of entering a new age and decide what part we have to play in how it all plays out in the long run. The Peace Movement of the 60’s, the age of sexual liberation following the introduction of the contraceptive pill, the rise of feminism, these were all born of the initial conjunction, but now we live with the consequences of these changes, some of which are far from what was envisaged at the time. It seems we’re often living in a world polarised between extremes, trying to find a way forward without really having learned from the past. This first square between Uranus and Pluto is our opportunity to learn, and then find a different way. Varcas is less sanguine than her colleagues about final outcomes of this envisaged process. She sees people in September 2012 "dancing in the darkness" and facing decades' worth of built-up karma, which finally returns to mete out effects, and match them to old causes. Several astrologers have compared this process to a lizard or snake sloughing off its skin, discarding old forms that no longer work. Hope (1896) by Edward Burne-Jones. Image Source: Art Renewal. Will the 1960s' revolutions be vindicated, exposed or discarded? Today's oracles are not always clear on what no longer works. But they generally believe that the 2012-2013 squares are crucibles for testing what works and what does not. In that generational reckoning with past ideals comes the anticipation of a future which may be better, but which in any event cannot be escaped. All in all, considering we live at the dawn of the 21st century, there is a stubborn persistence of mythical and ancient ways of reading history. These dire predictions could be another example of how the Web's hyperrationality can sponsor a neo-Romantic explosion. 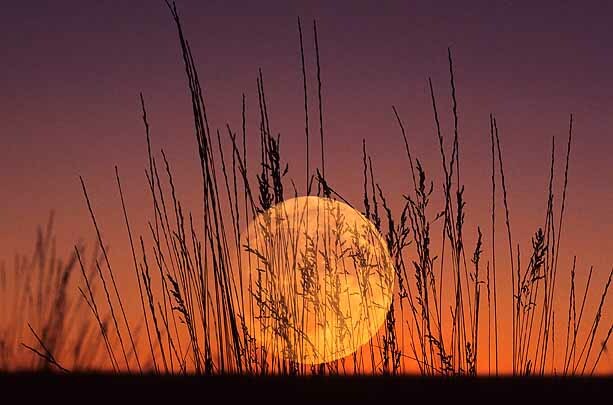 Even though a change of seasons speaks to some elemental shift in perception of the world, dark karmic revolution is a lot to hang on one Harvest Moon! For skeptics who want to confront personal troubles, financial cliffs, religious strife, international tensions, environmental crises, and nuclear stand-offs without myth or metaphor, here is a final antidote: Bill Nye lightly dismissing astrology. Astrology, as far as my research has led me, is THE programming. The programming, which keeps this whole illusion of time, in motion. I feel it's important to understand the astrology, and then, transcend it. However, those who are not conscious of the astrology, most likely fall under the sway of its patterns. Energy is neutral, unless directed. If one has an idea about how certain forces can contribute to a more-than-likely result, based on past patterns of behavior, then through that understanding, one can take another way, and change. One can re-direct that energy, break a pattern, become more conscious. Thanks for all the terrific articles you write. I check in everyday, but I don't always comment. Astrology: you make an interesting remark about the power of suggestion. I wonder sometimes if astrology is, among other things, a symbolic placebo that nonetheless has an effect because it directs our sense of purpose, or the directs our focus and energies. I really enjoyed this article a lot. I had a dear friend who did charts move forward in life's greatest metamorphosis last year. This is just one aspect I miss of her and makes me think of her. While nothing startling or destructive, we had 3 earthquakes in North Texas within the 24 hour period. Of course until all of the fracking started, this wasn't especially common occurance. Or at least not to where people tended to notice on their own. The agency reports that without much study it cannot be confirmed if these occurances in the past years are natural or manmade (ie fromfracking), but if you ask those who live in the vicinities where this occurs their opinions and observations are quite strong. Humorously the company that controls most done in the area bombards us with commercials declaring the environmental benefits of their presence. I detest those commercials. As always, I am enjoying your posts. Thank you and brightest blessings. @TOB: A little off topic, there's this interesting thing going on in the financial news in America right now. The talking heads on the news keep chirping about a coming "fiscal cliff" after the elections. You see, the politicians couldn't agree last year on what to do about all the debt that's being accumulated, so they agreed last year to put everything off. Thing is, they set all the deadlines to coincide on 01/01/2013(!). So a bunch of tax cuts expire, automatic budget cuts occur, and the US runs into a legal "limit" where it is unable to borrow any more without a new law being passed. Now one wouldn't normally associate this dry conversation about government budgets between folks in business suits on financial news TV stations with impending doom, but it's funny that it all ended up coinciding with the Mayan calendar stone. I even read in one Republican account someone fearing "tax-mageddon" as a consequence. All that millenial language! It's just gotten really pervasive, this sense of changing time. But then, you knew that already! Hi Anon, thanks for your comment; yes, this blog is an effort on my part to discuss Millennial fears, speculations and chatter and then analyze what they mean culturally, but also what those anxieties means in terms of the real bottom line. I notice that 'the real bottom line' keeps moving these days - LOL. Financial ruin and fiscal cliffs - I will turn back to that after the American election.